If you’ve ever been refused an apartment, or misunderstood because of a cultural difference, there’s a chance your basic human rights have been infringed upon. 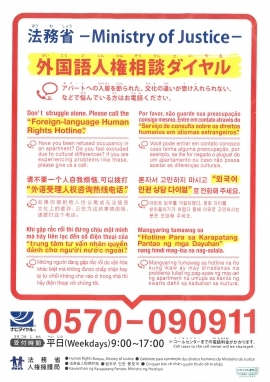 For those who would like to confirm whether their encounters were human rights infringements, there is a human rights desk for foreigners. National and Local Regional Legal Affairs Bureaus have information desk support for foreign language speakers with human rights issues. ・English, Chinese, Korean, Tagalog, Portuguese Vietnamese.